Home > Why marine plywood? While small stitch and glue boats can be successfully build with inexpensive exterior plywood, there are many advantages to the use of quality marine plywood. Marine plywood provides greater protection: a small scratch through the resin or glass, if not repaired, may expose the plywood to water. Inexpensive plywood may not last long in that case. Marine plywood strongly increases the resale value of your boat. Marine plywood is stronger and has consistent mechanical properties: no voids. Marine plywood is much nicer and easier to work with. 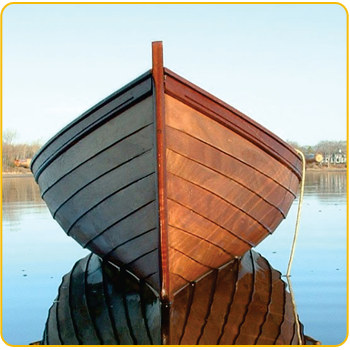 For small boats, quality 4 mm plywood is a good substitute for the 1/4″ exterior ply often specified. Marine plywood (except for Fir) will not check. That feature may by itself pay for the difference in cost. To get a good finish with Fir or Pine, the hull will require extra fiberglassing and large amounts of fairing compound. This is not necessary with Meranti or Okume. The use of marine plywood is a must in most manufacturing of boats. Fast planing boats are subjected to heavy bottom pressure and marine plywood should be used for the hull panels for mechanical reasons. The designer of your planing power boat probably specified marine plywood for this. Large displacement type boats that spend all their time in the water, at the dock or at sea, should also use marine plywood. While the fiberglass and resin will protect plywood, any scratch or dent may allow moisture to creep in and damage cheaper commerical or exterior plywood. Marine plywood will give you peace of mind in addition to all the advantages listed above. Our company is a manufacturer of commercial plywood with okume/bintangor face, bs1088 marine plywood made of okoume veneers.